Jerry first came to my attention as the coolly capable right-hand man working the tapas bar at the Harvest Vine. Later, he helped open Crow, then lent an occasional hand at Spinasse, making pasta. Most recently, I’ve been privileged to sit at his kitchen counter at Crow’s sister-restaurant, Betty, going gonzo for his perfect pan-seared chicken breast. Bar del Corso, with Corso presiding in the cucina — and his graphic designer-bride Gina Tolentino as marketing manager — will celebrate its grand opening on Beacon Hill next week. Last week, Corso took time from his busy schedule to chat. Q: I’ve always found you behind a counter, and you’ll have one here, too. Do you like working in view of customers? A: You make a lot of friends working behind the counter. It’s like being a bartender. People love to have conversations about food. Q: How many restaurant kitchens have you burned your arms in? A: I’ve probably worked at 20. After Cafe Lago opened [in Montlake, more than 20 years ago] I spent a couple years there. And I did a stint at Campagne, but French food wasn’t my thing: I had to follow my heritage. I’ve worked at Obelisk, a prix-fixe Italian restaurant in Washington, D.C., two different times — first as a cook, and again, more recently, as head chef for two years. The first time I traveled to Italy — with a backpack on my back — I was in my early 20s [he’s 48], and spent a year working in four different restaurants, in and around Rome, and up north in Piemonte and Umbria, which led to a job at Sandro’s in New York City. Q: I’m assuming you won’t be offering chicken Alfredo pizza like they do at Olive Garden, especially since you’ve gone to the trouble of importing a custom-built oven from Naples. A: I’ll be cooking with local ingredients. 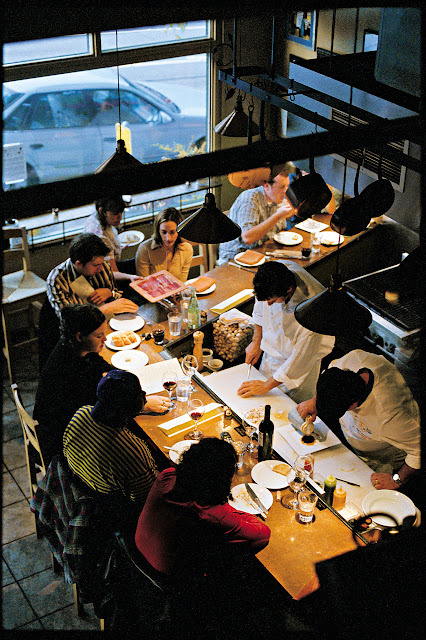 We’ll have a simple menu of Neapolitan-style pizza and antipasti-type plates. Seasonal vegetables like fava beans or artichokes; traditional things like cured meats; maybe fresh octopus, sardines or clams. In theory, you’ll come in and have a few small plates and order a pizza. But if you want to sit at the bar and have crostini and a cocktail or a glass of Vin Santo, that’s OK, too. 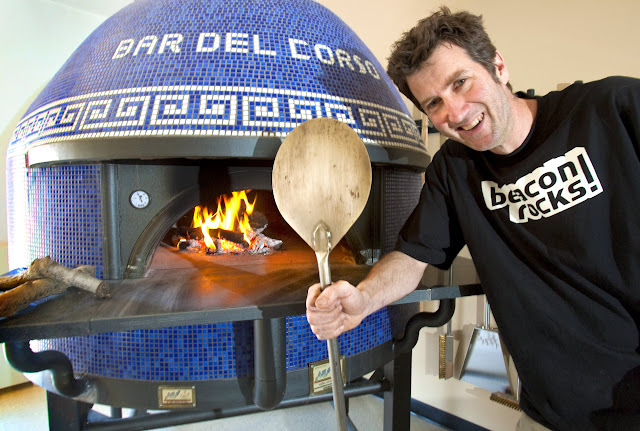 Q: People squawk about Neapolitan pizza, the thin-crusted pies that, like yours, are baked in a wood-fired oven. They say they’re “too soggy in the middle” or “too burned around the edges.” Discuss. A: Having spent some time in Napoli, the pizza can be like that — a little soggy in the center. These pizzas cook for 90 seconds in a very hot oven, and depending on the water-content [of the toppings], that water comes out. It’s my goal to try to make that happen as little as possible, because I don’t care for it. I’m not going to follow all the rules of Neapolitan pizza-making, but I make the dough and use the oven in the same manner. I’ll have a pizza Margherita, fresh arugula and prosciutto, and I love anchovies. I have a garden full of fava beans right now, so you might see some of those. Q: Speaking of raising things, tell me about the pizza parties you held to fund your business. I understand you’ve raised 90 percent of your target goal. A: We built a wood-burning oven in our backyard at home and then decided to host fundraisers there. We had four or five last summer. The Beacon Hill Blog posted about us, and people contacted us, wanting to invest. It was amazing how many people who lived in the neighborhood were excited. 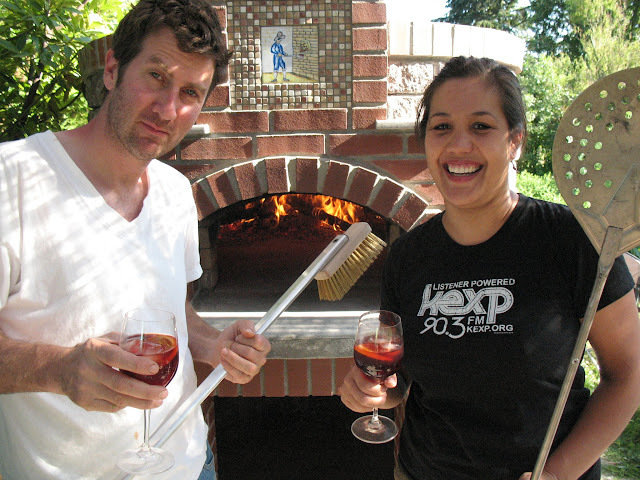 Jerry and Gina at home with their other pizza oven. Q: You’ve completely revamped the old Beacon Pub. Why Beacon Hill? A: We live here. Since we moved to Beacon Hill, I’ve always wanted to create a lifestyle — and not drive to work. Here, we have three Filipino restaurants, which are fun. We have a Mexican restaurant, El Quetzal, a few doors down that recently expanded, and we’ve got a couple coffee shops. We’re an up-and-coming neighborhood.